Manufactured: Sharp, Japan, February 1974. 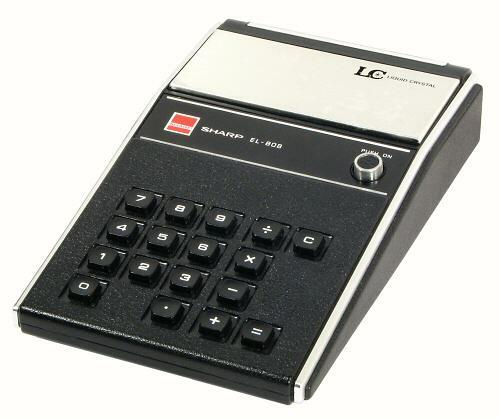 The Sharp EL-808 is a basic four-function calculator with an early liquid-crystal display. The first experimental liquid-crystal display was built by RCA in America in the late 1960s. The first portable calculator with an LCD display was built by Sharp in May 1973 (the EL-805), with this EL-808 following in 1974. These early displays used a reflective technology which produced bright silver numerals against a dark background. The displays were clear and easy to read, but were very expensive to produce. It was still some years before LCDs displaced vacuum fluorescent displays in low-cost calculators. The round button at the right of the case opens the display cover and turns on the power. The cover protects the display, controls the ambient lighting, and reduces reflections from the glass. 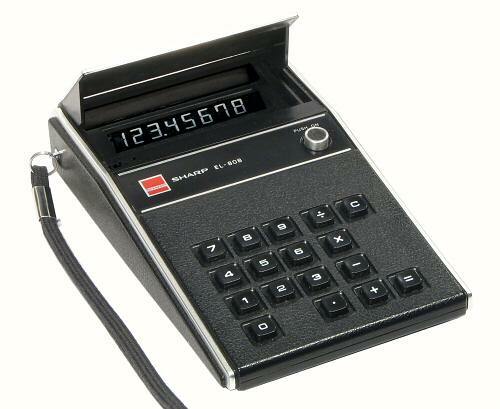 The calculator has a very simple keyboard with no additional controls or features. The function keys operate in arithmetic fashion. The decimal point floats within the 8-digit range. Over-range or division by zero lights all the zeros and decimal points. The only "trick" to this calculator is the provision of reciprocals through single-factor division. In multiplication, 2 Mult Eq produces 4, a further Mult Eq gives 16, and so on (as expected). In division, 2 Div Eq produces 0.5 rather than 1, and a further Div Eq returns to 2. 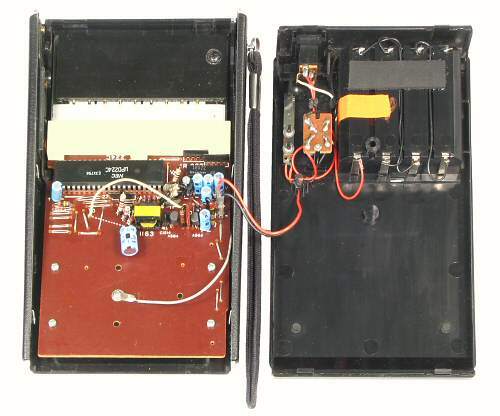 The upper section of the case (left) holds the main circuit board, keyboard, and display. The lower section (right) contains the four AA batteries, DC input socket, and a power switch operated by the display cover. The two halves are joined by a single screw through the battery compartment, and two wires with plug-on connections. 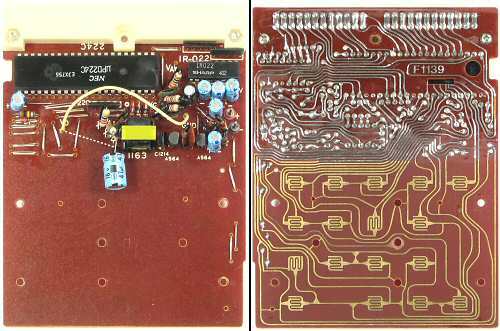 The single-sided phenolic circuit board measures 90 x 110 mm. The central section carries the NEC uPD224C processor in a 42-pin DIL package, a Sharp IR022 in a 16-pin pack, and a transistor-driven power supply inverter. The display module plugs in to a 24-way edge connector at the top of the board. The lower section is gold-flashed for the keyboard matrix. The current drain from the batteries is 55mA (330mW), and is independent of the numerals displayed. 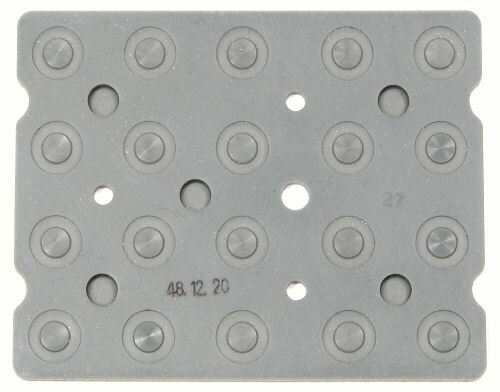 The elastomeric keysheet carries a date code "48.12.20" in YY.MM.DD format. The years are counted in the traditional Japanese method based on the reign of the current emperor. Year 48 of Emperor Showa (Hirohito) was 1973. The connections for the liquid crystal display are formed on the under side of a sheet of 3mm glass which measures 88 x 52 mm. A smaller glass sheet is epoxied to the rear, with a black plastic panel behind. 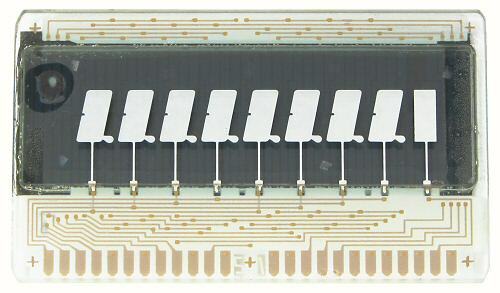 The whole module is 7mm thick. The 7-segment numerals formed in the reflective sections are 10mm high, 5mm wide, and spaced 8mm apart. The section at the far right contains only a minus sign. Original text and images Copyright © John Wolff 2007-18. Page created: 18 August 2007. Last Updated: 16 April 2018.